Please welcome guest poster Amy to Adventures in Breastfeeding! We know it can be difficult to get in shape when you have a hungry baby to feed, but Amy has tips and motivation to help you reach your goals! Yes! You can do intense workouts and get back to your pre-pregnancy weight while breastfeeding! I’ve debunked that myth. As a group fitness instructor and mom of a 9 ½ month old baby girl, fitness and nutrition are a major part of my lifestyle. Like many moms, I was eager to shed the pregnancy weight once I had my baby. I gained about 40 lbs, and lost a lot of muscle tone. Prior to getting pregnant, I was in the best physical shape of my life. Having a baby and getting back into shape has truly been humbling. Be realistic. I certainly couldn’t pick up from where I left off with my extreme workouts and competitive running once the baby was born. So, I walked. My belly bounced and I was easily winded. During those boring walks, my mind wandered. I envisioned myself running strong again, and even coming back faster. It became my motivation. Find your comfort zone, then get out of it. Eventually, I began incorporating some jogging with my walking. I started working out in my home gym. It was tough. My belly would touch the ground when I did push-ups. I was easily winded. However, I never gave up. Be patient with weight loss. I was working out every day. My strength and endurance was improving. However, the scale wasn’t budging. I became frustrated. As a fitness instructor, I’ve helped people lose hundreds of pounds, but couldn’t lose the weight myself. I started to resent people who said that the weight would come off easily because I was breastfeeding. Typically, those people have a commonality: They either don’t have kids, or have never breastfed. With very little sleep and a massive appetite from breast feeding, I thought I was doomed to never lose the pregnancy weight. 1st place in a 5K after having Ava! No gimmicks. I did gradually start losing weight, because I was doing it the healthy way with proper diet and exercise. I never deprive myself of food. I eat when I’m hungry, but make wise choices. I think of food as fuel for my workouts, but most importantly as giving the best nutrition to my baby. No crazy diets. No fad supplements. No trendy workouts where I could easily get injured. It took about 7 months, but I finally felt comfortable in my pre-pregnancy clothes. Make the time. Fitness should be part of your daily routine, not a chore. If getting in shape is a priority, you’ll find the time. Get off Facebook. Quit Candy Crush. Stop baking cookies and knitting scarves. Depending on my workout, I wake up every day between 4:00 a.m. and 5:00 a.m. I pump my milk and deposit it to my freezer stash. I either run or do a workout in my home gym before my baby wakes up at 7:30 a.m. I really enjoy my workouts and look forward to them. If you find the workouts you love, you’ll stick to them. Drink even more water. As breastfeeding moms, we already drink an abundant amount of water to maintain our supply. Well, if you’re exercising, you’ll need to drink even more. I am pretty much glued to my water bottle all day. I also drink a lot of coconut water as a natural energy drink. It’s loaded with electrolytes. I did it! Ultimately, the vision and determination of coming back stronger and faster became a reality. 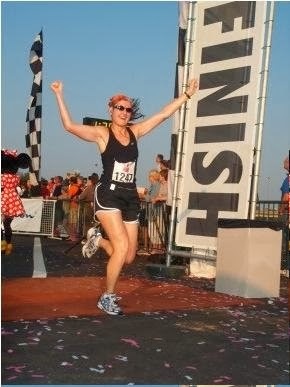 Since having my baby in March and breastfeeding strong, I’ve run six 5K races. I’ve placed 1st in my division in every race, and beat my personal best time twice. I am also looking forward to teaching Body Pump again, a fitness class with weights, beginning January 14th. My passion for helping others accomplish their fitness goals is stronger than ever now. None of this was easy to accomplish. I am still trying to figure out balance in my life with baby. My next big challenge to overcome is finding the time to style my hair and put on makeup, which seems almost impossible most days. Ultimately, it’s all about priorities and perspective. My workouts give me time to myself. Sometimes it’s the only time I have for myself the entire day, so I look forward to it. Do you have health and fitness goals this year? Share your hopes and successes! Amy Drazen lives in Orlando, Florida with her husband and daughter, Ava. She is an accomplished runner and has won various awards in racing. Amy is a certified Les Mills International Group Fitness Instructor in Body Pump and Body Combat. She enjoys healthy cooking and nutrition.